Your computer is full of viruses and your antivirus seems to be unable to do anything to fix the situation? You should have downloaded and installed the Ultra Virus Killer (UVK) software. Very practical, it is able to disinfect a computer thanks to its many features. Ultra Virus Killer has been in existence since 2010 and has improved significantly over time. Its main functionality is the "system repair" mode: these are basic corrections to solve most of the problems a user may encounter. For more specific needs, it is possible to use the "System booster" option which allows the registry to be cleaned efficiently. 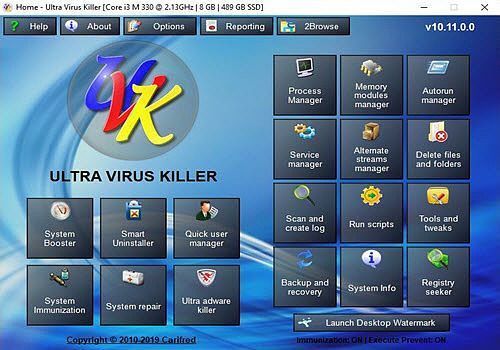 Ultra Virus Killer allows you to quickly neutralize most malware. It also highlights many other tools such as a module to properly uninstall software or a utility to create recovery points.